Home > Battery Eliminators > CBE-196 : battery eliminator for ICOM radios. Fits IC-T2A, IC-A4, IC-F3, IC-F4 etc. 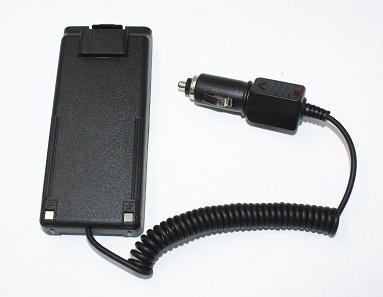 The CBE-196 is a Battery Eliminator / DC mobile power adapter for ICOM IC-T2A, IC-T2H, IC-A4, IC-F3, IC-F4 radios, etc. Plugs into 12-13.8VDC socket; has coiled cord; clips onto back of radio (like the battery does). The battery shell housing has built-in noise filter & voltage regulation. Enables instant Hi-Watt operation from a 12-13.8VDC socket.